Doubts or discovery of the Truth? I do not think that Agnes Bojaxhiu, mother Teresa, highlight of devotion to human misery, highlight of solace, used to have doubts. I do not think that she entertained doubts about the Light, ever. A woman that does not believe in the Creator, and that does not believe in the great hopes the Creator cherished, and has not ceased to cherish, that his creature would eventually agree to live happy some day, that woman could not, not out of patience specifically divine, devote her love and life to the creature whom only freedom and delight to sin make suffer and be wretched and mortal (Rev of Arès 2/1-5). A woman that believes in man believes in God's image (Genesis 1/27), believes in God in some way or other, whether expressly or silently. That woman moreover has a spiritual life very special in beauty (Rev of Arès 12/3). Therefore, why the letters that the news are currently commenting on, through which mother Teresa told her doubts, her "emptiness"? Plain is the answer. Whoever finds out the Truth—Truth is that the world has to change (28/7)—just as I found it out, albeit under quite different circumstances, reaches the same dilemma, and then the same emptiness. Anybody, even a grande dame of charity in Calcutta (India) or an undeserving petty fellow made a prophet in Arès (France), dismisses the religious, theological God and Christ, when he or she discovers the teleological Father and Jesus, the real Father and Jesus of the true ends (Rev of Arès XXXIV/1-4), of the real relationship between the means and the ends, the means to conquer evil and the ends of the Good, the Victory of which the men of the time to come (Rev of Arès 30/13) will have to carry out. 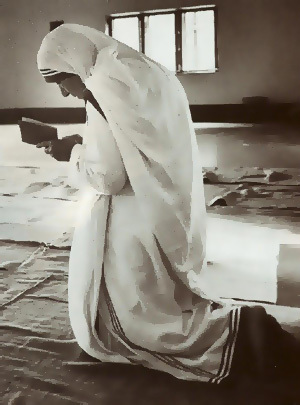 It was as a woman that mother Teresa discovered Truth. It was as a woman that for decades she was confiding in her religious friends about her "emptiness"—just a cultural "emptiness"—that the discovery had dug deep within her. It was as a woman, that is, in a modest, limited way, because as a nun fully dependent upon the catholic church socially and financially, that she from instinct felt that she should cautiously hide the Core of her thought. She "just shut up," as people say. She alluded to her doubt without her scratching its surface, for fear (rightly or wrongly) that she might find herself in some social and financial death, just as I would find myself twenty years later. But as a man, a man in his prime, I was able to overcome the isolation complete and financially helpless, into which the Truth I had been given by Jesus had thrown me and my family. Yes, I did experience Teresa's "emptiness." But such an emptiness holds more Truth than all of the ideas quirky or dishonest, though very spick-and-span, which mankind through religion and politics, all of their vainglories, has thought she had to garrison it. Some ask me: Why will the catholic church canonize mother Teresa? Wasn't she obviously having doubts about the church? Canonizing is building the invisible mausoleum on top of a dead person that people are strongly urged to pray to. A piety that I am in charge of banning (Rév d'Arès 33/35), it's true, but I have issued the ban, it is The Revelation of Ares. The church agrees or turns it down, freely in control of itself (Rev of Ares 8/1) just as any assembly on earth. I figure that, in the tough world, it may not be improper to show the image of a woman who quenched motherless babies' thirsts, and who clothed poor guys, and who tried to be equal in devotion with the angels as well as she could (Rév d'Arès 11/1-3). There will forever be something unclear about Mother Teresa. Did she really take a big weight off the the shoulders of the Calcutta destitute? Did she really converted many Indians to christianity? Did she really lead the main charity by the Ganges banks? Hasn't there ever been any native charity, hindu or humanitarian, maybe way more efficient than Mother Teresa's organization, at Calcutta? If so, what was the real impact of her devotion? Will levelheaded folk really snuffle into their handkerchiefs, mumbling, "I can't imagine why it's gotten me that much?" on the day the pope is canonizing her? Only very emotional folk will do so. I think that most people, if not all people, won't let themselves drift off into hugs-and-tears emotionalism on the canonization day, a soap opera sentiment tricked up by the mass media. I think that Mother Teresa was just a (very noticeable) good Christian among good Christians. A saint? The Father is the only Saint (Rev of Ares 12/4). Unquestionably, the Father is the only Saint (Rev of Arès 12/4). But I don't think it wise to dwell on a word, even the word saint. I've figured out that the catholic church some time ago changed its mind about sainthood and that mother Teresa constitutes a typical instance of that change. I think that it's the catholic church of today, far less deferential to the martyrology, that is going to celebrate mother Teresa's "sainthood." I think that the pope is not unaware that she was a rebel of sorts against clergy authority, although her outstanding charity kept from scandalizing (or from showing their disapproval) all those who still clung to a traditional concept of Roman order. Benedict XVI obviously has decided to glorify mother Teresa as an epitome of modern charity—or charitableness?—and is going skillfully to align himself with the policy of sentiment and feelings. He means to show that the church has grown capable of placing goodness above faith and obedience...if necessary. Isn't this the general inclination —the Good and freedom —taught by The Revelation of Arès? It is. Metamorphosis, whatever, goes slowly. Can the grub in its hurry catch up with the bee (Rev of Arès 24/2)? No, it can't, it hasn't got wings. But mother Teresa had got some, like a cherub! Wonderful comments on Mother Teresa and her dependence on the church of Rome! If B. XVI is "placing goodness above faith and obedience..." that would indeed be a new and encouraging sign.